Dr. Gangrene's Mad Blog: The Curse of Frankenstein will Haunt you Forever! 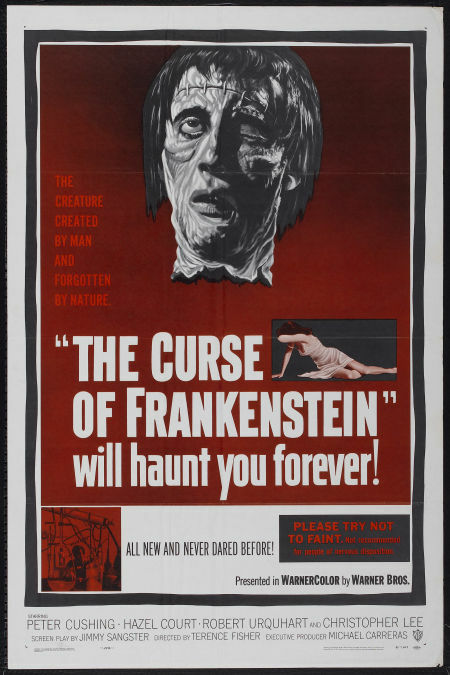 Another beautiful CURSE OF FRANKENSTEIN poster today, this one in lovely blood tinted crimson with a severed FRANKENSTEIN'S monster head and the tagline "The Curse of Frankenstein will Haunt You Forever!" PLEASE TRY NOT TO FAINT. Not recommended for people of nervous disposition. Love it! Hammer working in some good old fashioned exploitation advertising techniques. A lost art nowadays! Why thank you Mr. Lonely that's about the best compliment a blog could receive. Visit often!